Handwriting Experts Spot Liars and Forgeries by thier John Hancock. During National Handwriting Week, January 22nd-29th, Handwriting Experts nationwide are hoping people take a second look at their coworkers' handwriting to forgeries, ethics, and lying. Even though handwriting analysis has been around for over 1000 years, most people still see it as a way to spot forgeries and evaluate ransom notes. They don’t realize it is such a fast and accurate tool for evaluating personality, self-improvement, and spotting troubled personalities around the office. During National Handwriting Week, January 22nd-29th, Handwriting Experts nationwide are hoping people take a second look at their coworkers' handwriting to spot danger signs in advance. As a simple test, anyone can look at their lower case “o” and it reveals a snapshot of how clearly they communicate with others. Just the direction and size of the inner loop reveals the tendency to either keep secrets, be blunt, be talkative, or even just tell a bold faced lie. If so much can be revealed from one letter, imagine what an expert can do with an entire page of writing! When I give an analysis, people swear I must be psychic or have been talking to their mother. It is a science and the truth comes out. Take a look a the lower case “o.” Single loop - keeps small secrets. No inner loop - blunt and candid. Double loops - run, don't walk to the nearest exit - big fat liar. If you see double loops, realize that these people believe telling the bold truth might make them look bad or hurt someone's feelings.... so they will shade the truth - or just lie. Watch out for Double Loops. Here are some famous liars who's handwriting would be interesting to analyze. Do they have the lying loop? Bill Clinton, OJ Simpson, Martha Stewart, Ken Lay, Enron, Michael Jackson, Heidi Fleiss. Curt Baggett is arguably the country’s top forensic document examiner, while his son, Bart Baggett, is the most well-known handwriting analyst in the world. (He has appeared on CNN, Court TV and in USA Today.) Bart learned handwriting from his father when he was just 14 and now holds seminars from Los Angeles, CA to Bombay, India, teaching the skill to police departments and the public. Baggett will appear on Los Angeles's FM 104.5 KBIG this Wednesday morning with Host Charlie Tuna analyzing handwriting as part of National Handwriting Week. 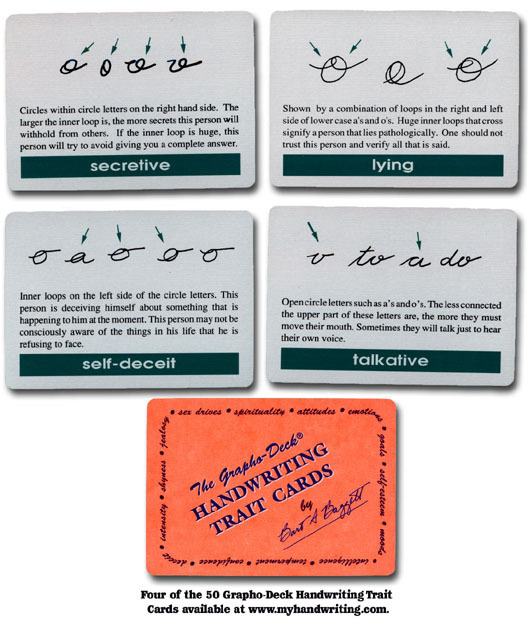 For more extensive interviews about handwriting analysis, contact Bart Baggett of http://Handwritinguniversity.com . For an interview about forensic document examinations, contact Curt Baggett at http://expertdocumentexaminer.com. Handwriting University SchoolLogo of Handwriting University.com Letter O ChartThe letter o meanings according to modern graphology. Bart Baggett, President Handwriting UniversityBart Baggett, President Handwriting University. Curt Baggett PhotoCurt Baggett, Co-Founder of Handwriting University's' School of Forensic Document Examination.